Badrinath is also one of the five Badrish. And the other four Badris are Yogdhyan Badri, Adi-Badri, Vridha Badri and Bhavishya Badri. The Tapt kund: - The Tapt kund is kund (Small Lake of water) of the natural thermal water. Which is comes from the Alaknanda River and snow peaks. Everyone can easily take bath on that water. And if you are put some packed rice by plastic and a cloth piece on the kund for some time they you will get cooked rice. Mana Village: - Just 3 Kms. Far from the Badrinath town. The mana village is the last village of the India after that the Himalaya mountains ranges is start and it is neared by China Border. The other interest things are Bhimshila, The source place of the river Alaknanda and many others. 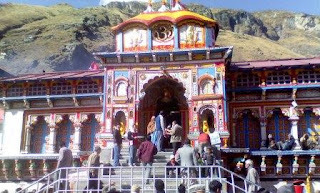 The Climate of Badrinath is always good for travelers and tourists because everyone can get here cold place in summer days. By Road: - Badrinath is well connected by Roads from other cities. By Trains: - The nearest Train station is Rishikesh and the distance is 300 kms. By Air: - The nearest airport is Jolly Grant Airport Dehradun, Distance is 315 kms. Accommodation for tourist: - you can easily take Hotels, Lodges, Guest Houses, and Dharamshala with some best cost. For Advance booking of Hotels, Lodges, Dharamshala you can also mail to us at: - onlineuttarakhand@gmail.com. Best Time to Visit: - May Month to July Month and Oct to Nov month.